The upcoming by-election for the Sibu parliamentary seat has placed this thriving town on the Rajang, Malaysia’s longest river, onto the national spotlight. IF you look at Sibu town from the air, you will see a modern urban landscape of well laid-out buildings with a good network of roads. Terrible as it may seem, it was a fire – in fact two fires – that made this town what it is now. The first fire occurred in 1889 when the town was just a sleepy hollow of wooden shophouses. The fire destroyed everything then. In the next blaze, which occurred on March 7, 1928, almost three hundred shophouses were razed to the ground and Sibu folk had to start building their town all over again. And from the ashes of this second inferno, they built a new town which, to them, was so beautiful it seemed like Sibu had emerged like a swan from its ugly duckling phase. The town now uses the swan as its symbol despite the fact that this bird does not exist here. Of late, Sibu has been a hub for cultural festivals, such as the Borneo Cultural Festival and the National Chinese Cultural Festival, that attract tourists by the thousands every year. If you are here on a visit, you may want to check out some of Sibu’s prominent attractions. As you go from one place to another, you will also learn the history of the town and the rich heritage of its people. Crowd puller: The Jade Dragon temple has been a tourist draw since its completion. This riverfront park is a perfect venue to admire the scenic Rajang River and Sibu’s beautiful sunsets while savouring a wide array of tasty food and other mouth-watering delicacies. Fishing enthusiasts flock here to indulge in their hobby on the riverbank. Completed in 2000, this garden was built to commemorate the first-ever World Hii Convention, which was attended by delegates from around the world. This park at Sungai Merah sits on the site where Wong Nai Siong, credited as the leader of the first batch of Foochows from China to settle in Sibu, landed. The presence of the park has enhanced the otherwise drab landscape of this satellite town. Nearby is the popular Sungai Merah Heritage Walk, which offers visitors an opportunity to revisit the history of Sibu and Sungai Merah. If you look closely at the river, you can see that the water changes colour from dark red to yellowish brown depending on the weather and tides. Located at the river front near the Tua Peh Kong Temple, this garden tells some interesting stories of the Chiang Chuan Clan in Sibu. Its walls are inscribed with carvings and statues that tell the history and heritage of these early settlers. Some carving experts from Fujian Province in China were specially commissioned to put the finishing touches for the Garden. Visitors will be enthralled by the green stone railings along the Nine-Bend Walk. These are engraved with carvings of the various practices of the Chinese. The Sibu Kutien Association adopted Bukit Lima Garden at Jalan Lanang in 2003 and turned it into the Kutien Memorial Park. This picturesque park is a place for leisure and recreational activities as well as a venue to learn about the association’s history and historical events. The Kutien Clan, which was originally known as Sibu Kutien Association, was founded in 1928 as an overseas branch of the School Board of Yutien Secondary School in Kutien County, Fukien Province in China. In 1985, the Sibu Kutien Association changed its name to Sarawak Kutien Association so that it could register all its clansmen in Sarawak as members. In the beginning, its sole purpose was to assist in providing education facilities in China. These days, it has integrated with the local society and is helping in the development of Sibu. Established by the Sibu Heng Hua community, this park tells the history of their migration from China in 1911. From the 100 pioneering clansmen, their numbers in Sibu have now exceeded 40,000. The pioneers came here with the sole purpose of spreading Christianity. Having successfully spread the Gospel, and with more clansmen coming here during the last days of the Ching Dynasty, they went on to build churches, clinics and schools. Pastor Lee Chang Sui was the first Heng Hua to step on Sibu soil in 1911. With the blessing of Rajah Charles Brooke, Pastor Lee and his followers were allowed to settle at Sungai Merah and Igan. It was only later that they expanded westward of Sibu. Taman Perpaduan was originally an open space which was maintained by the Sibu Municipal Council. It was only upgraded into a park in 2004. Situated at Jalan Selasih Timur, off Jalan Lanang, the park has an indoor basketball court, some wooden benches and a jogging track. Located in the heart of a housing estate, Taman Perpaduan is also known as Poh Yew Garden. If you want to dine under the moon, this is the place to go. It has an open space with 50 food stalls and is included as one of the community parks here for its many facilities. A favourite among diners, the park also has a children’s playground and a stage. Lake Garden, located about 1km from the town centre, is one of the ideal places in Sibu to escape from the hustle and bustle of city life. It is also the most-sought out place by remote-controlled powerboat enthusiasts who show off their skills on the lake every evening and on weekends. For those who are not into power boat racing, the jogging track is good for sweating it out in a serene environment. Situated about 5km from the town centre, this park has won the National Landscaping Competition Award twice – in 1997 and 1998 – for the Park category. The undisputed mother of all parks in Sibu and one of the town’s green lungs, it has a suspension bridge, sheds, barbecue pits and an eatery which serves affordable but delicious food and drinks. It is also the perfect place to enjoy a bird’s eye view of Sibu town. Located on a peat swamp forest within the Bukit Lima Forest Reserve, this park is a good place to experience the wilderness of a natural forest within an urban environment. Covering about 90ha, it hosts an astonishing variety of flora and fauna commonly found in a peat swamp forest. There are 52 wildlife species comprising birds, bats, lizards, snakes, frogs, terrapin and long-tailed macaque. The main attraction is the nature trails where visitors can go for short treks, jogging or nature-watching. 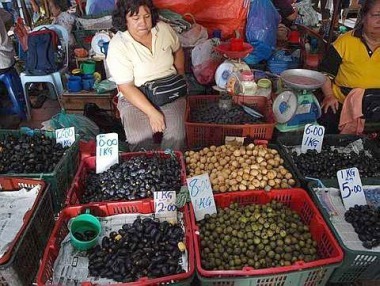 Local produce: A native woman selling black olive locally known as ‘Dabai’ at the central market. 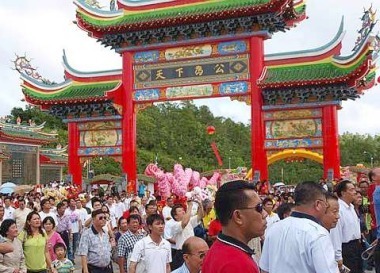 The Yu Lun San Tien En Si (Jade Dragon Temple) at KM26 Sibu-Bintulu Road is the latest tourism draw in Sibu. Built at a cost of RM60 million, the temple is claimed to be the largest in South-East Asia. It was opened to the public in October last year. Since then, visitors from abroad including China, Thailand, Hong Kong, Japan, Singapore and Peninsular Malaysia have come to this unique site. The central market with over 1,300 stalls is recognised as the signature tourism attraction of Sibu. The market offers a vast array of goods, from the mundane to the strange, and it is the best place for tourists to soak in all the sights, sounds and smells of the town. Visitors to Sibu always include the Tua Peh Kong Temple in their itinerary. The main attraction here is the seven-storey Goddess of Mercy pagoda which is part of the temple. From the top of the pagoda, visitors can get a panoramic view of the town and a breathtaking sight of Malaysia’s longest river. If you want more information about the temple, ask for Tan Teck Chiang, its caretaker. He will be able to help you. 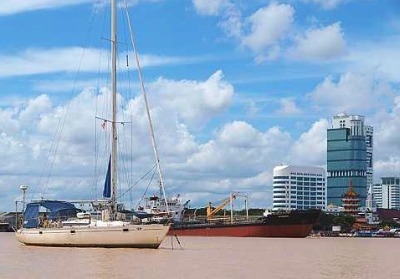 The annual Borneo Cultural Festival, normally held on the second week of July, offers an opportunity to experience the unique cultural contributions of the various ethnic groups from around the region, according to Sarawak Tourism.